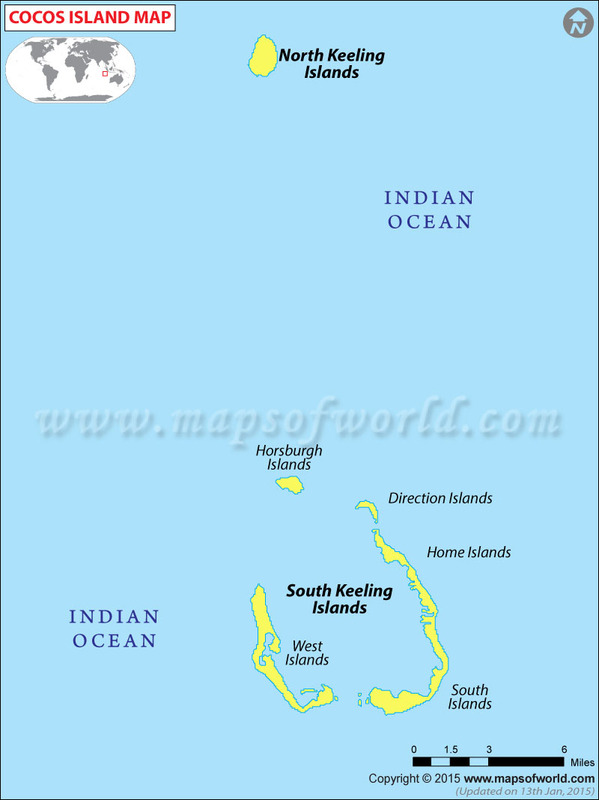 The Cocos Islands or the Keeling Islands refer to a group of coral islands located in the Indian Ocean, which forms the overseas island territory of Australia. There are 27 coral islands and 2 atolls in the group, covering a total area of 14 sq km. Only two of these islands are inhabited - the West Island and the Home Island. Cocos Islands had an average population of 600 in 2009. The earliest settlement in the Cocos Islands was established by a party led by Alexander Hare in 1826. They started to harvest coconuts and produce coconut oil. This was followed by the arrival of the party of Captain Clunies-Ross in 1827. In 1886, all the lands of the island were granted to his descendant by Queen Victoria. The island played a strategically important role during the two World Wars and was occupied by the Allied forces during the Second World War. It came under military rule after the war. Finally, it was permanently transferred to Australia on 23rd November, 1955. The Cocos Islands is located midway between Sri Lanka and Australia in the Indian Ocean, lying 2,750 km to the northwest of Perth and 900 kms south-west to the Christmas Islands. These are all coral islands with a float low-lying landscape which has been densely covered with vegetation. Lagoons are present here while the colorful corals are a delight for divers. There are no rivers or springs. Fresh water is available from water lenses in the large islands. These are depressions where rainwater accumulates during the rainy season. You can fly to the West Island airport that provides regular flights to Perth in Australia with stopovers at Christmas Islands. The Cocos Islands is a popular port of call, and ships going to Mauritius generally halt at Direction Island. Regular ferry service is also available to Home Island. The islands experience rainfall for much of the year from April to September and from March to July. Occasional low pressure systems are equally popular and you can experience them from January to March. However, as the temperature remains constant and comfortable, you can visit the islands any time of the year. Diving is the most important thing to do in the Cocos Islands. The archipelago consists of coral islands and atolls, which are a beautiful sight. The waters are uncrowded and the visibility is excellent, extending to over 25 meters. There are 20 diving sites in the Cocos Islands. In addition to the colorful corals, the reef is rich in a variety of marine life like the grey reef shark, barracuda, butterfly fish, Cocos Angelfish etc. There are several sites which also offer snorkeling facilities. Canoeing and bird watching are the other popular activities that you can enjoy here. The beautiful natural beauty of the Cocos Islands is its greatest attraction. Events like the annual Lagoon Swim and the Music and Wine festival offer added excitement. Only 2 out of the 27 islands are populated here, hence the choice of accommodation is restricted in Cocos Islands. The Cocos Castaway is the most popular resort with a beautiful beach and self-contained units. In addition, Cocos Homestead, My Island Home, and The Lagoon are the other holiday homes located in the islands. The Cocos Beach Motel is located in the central part while architecturally designed cottages called Cocos Cottages are also available.